Wow! I think I'd totally make a splash at storytime in this stunning dress, entirely constructed from pages of Little Golden Books. The best part (aside from the gorgeous, rainbow-hued ballroom skirt, of course) is that the bodice is entirely constructed out of those iconic golden spines. Lovely! Check out the designer, Ryan Novelline's website for more pictures. WOOOW. Love, love, love this dress! Absolutely gorgeous! I know! I can't believe it's made out of actual books! That's amazing. You're right, you'd be the coolest storytime librarian ever if you showed up wearing that dress. This is amazing. 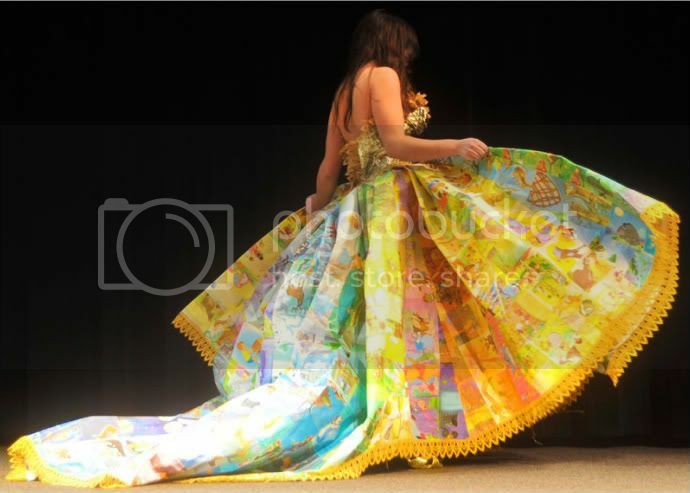 A fairytale dress made of fairytale books. I can only imagine how much dedication and attention to detail it took to craft such a masterpiece. A jaw-dropping, sustainable couture that can place the designer among green designers. Love how he added metallic gold thread to the dress to give that dress the "fairy tale" magic. The gorgeous dress is fit for a fairy tale princess. Michelle, can you believe that the book pages used in the dress are apparently worth 22,000 square inches of skirt?